I DID IT! Last night I ran 3.5 miles without using run/walk intervals! I did walk the incline on the bridge that’s on my route, once on the way out and once on the way back. But other than that I didn’t take any walking breaks and I FELT GREAT! To be fair, I had almost the perfect conditions for a run. It was 68 degrees, the moon was big and bright and my legs were feeling fresh since I only ran one mile yesterday. Since I didn’t have to be concerned with when my walk intervals were coming up I was able to just really get into the run and zone out. It was wonderful! I honestly feel like I blinked and then I was back home (and was really sad that the run was over). The whole thing made me think it is possible that I can actually do my long run this weekend without walking breaks. I definitely still had a lot more in the tank when I got home…. I’m so excited to try it out! Also, at one point I had to use the bathroom and a magical, clean port-o-potty just happened to be on my path. The world works in mysterious and amazing ways, haha. After the run Adam and I went and had tacos at Zona Fresca for about the 10th time in less than a month. Their steak tacos are just too good. I did actually cook on Tues. night though! As a side dish I made this spinach thing. I basically just threw some ingredients together and it came out really good! I am calling it Sizzling Spinach because I’m not sure what else to call it. I just threw some baby spinach in a pan and then added some shredded mozzarella cheese and some garlic pepper powder. I let it all sit in the pan until it started sizzling and then I ate it. It kind of almost tastes like Spinach Artichoke dip… minus the artichokes… and cream…. I liked it anyway! (I’m not a cook, what can I say… I’m good at ordering take out). What’s on your agenda for today? How many miles? Hooray for such a great run!!! You stole my moon! 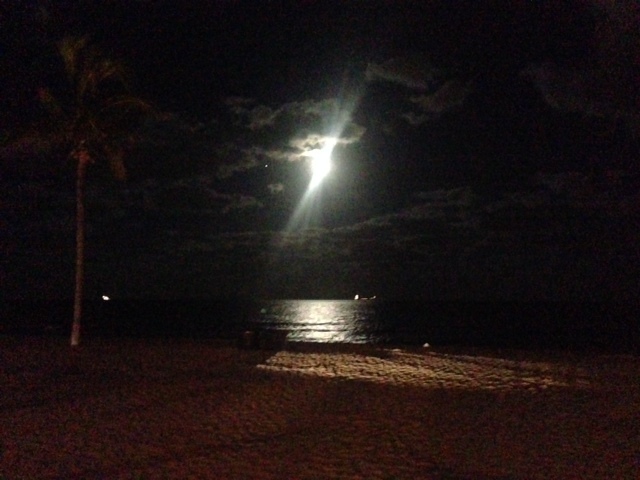 Monday we had that huge, bright almost-full moon to run by, and last night there was NO moon in the sky when I ran! So weird! Aww well thanks for sharing it with me! Good for you! I bet more than anything running without taking breaks will be a mental challenge, rather than physical. The moon here was crazy wild looking last night, too. We took a night hike since it was in the 60s and thoroughly enjoyed it! Yea! You did it! Do you run at night often? I would never think to do that but I bet there is something relaxing and refreshing about it. I do all of my week day runs at night. I find it impossible to get up super early to run before work. I’m not a morning person at all! 🙂 I love it. After sitting at a desk all day it feels great to get out for a run! It’s cool you have a path that works for you at night 🙂 Congrats on the great run! You can do it, just think one more mile…and before you know it happens. It took me a long time to get to three miles consistently with no breaks but from there adding miles became much easier. You have crossed a new threshold!